PRO-UTILISE is a computer aided modelling solution, which uses agreed "REAL" client data and applies a set of heuristic mathematic and logical algorithms to identify the current efficiency of the clients resources. This is not specific to any industry sector or vertical and can be tailored to suit any business where event/task driven activity are used, it is a solution which is developed on site with the client initially then expanded, run and reported back to the client. Additionally the model can propose specific areas of the business where resources can be reduced whilst maintaining and protecting customer service levels. PRO-UTILISE is a PROVEN solution, which has resulted in £000K’s savings for our clients. Triway have seen ROI within 3 months for various clients. 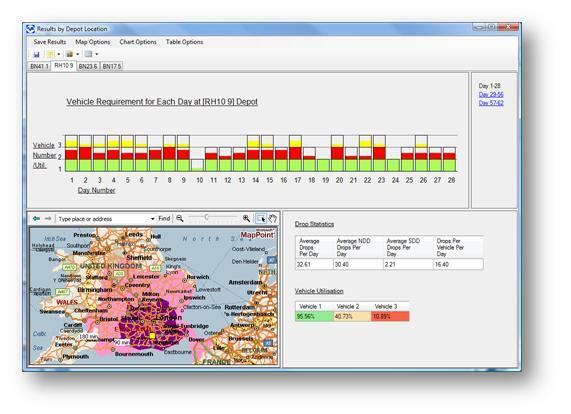 Pro-Utilise combines allocation algorithms and quick routing and scheduling algorithms with the clients existing data to determine the resource requirement for each day of the study recommended to be between ½ a year and a year. A benchmarking exercise in using the clients current operational infrastructure and depolyment situation is used to accurately anchor potential savings. 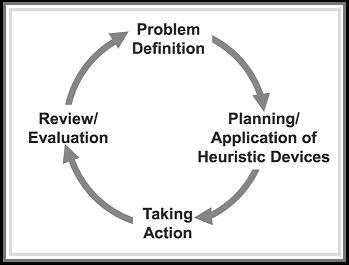 Touch points including Events/Tasks are assigned using mathematical heuristic algorithms. 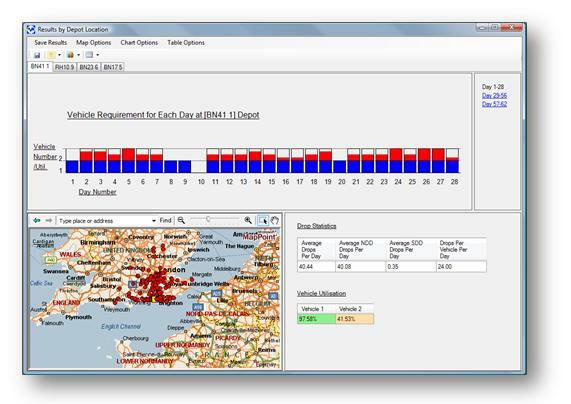 Once assigned a bespoke transport routing algorithm is used to determine an appropriate transport fleet size. Modelling revolves around events/tasks, stem mileage, road traffic conditions, vehicle type, fixed conditions, applied costs (agreed with client), mixed variables as required (eg fuel price, lease cost etc). The model identifies and records current utilisation and where pinpoints where reductions can be made. Futures can be modelled if agreed within scope. PRO-UTILISE is a custom/ BESPOKE solution. Can apply to any industry vertical / sector by design (event driven). There are no limitations to what scenarios can be modelled. There are no limitations to the complexity which can included. Company specific cost structures are used. Resources are modelled in a way that best suits the clients situation. Validation of all Data with the Client throughout project(s). We work with the Client to define the solution, end to end. Work is undertaken against a set Service Agreement. Proposes multiple solutions based on specified / applied criteria. Enables “What if” scenario modelling. Model is run by Triway consultants at client request on demand. PRO-UTILISE can be developed to display as a customer facing dashboard type report or subject to agreement in any other format as determined. Alternatively tabulated reports in detail or summary can be developed bespoke to assist clients requirements. Client Visibility and understanding of current operational utilisation. Client Visibility and understanding of proposed operation utilisation. Clear view of utilisation flexibility (Operational flexibility). Availability to fix specific resources and vary others. Availability to run other “What if” scenario. Clear indication of “REAL” achievable potential cost savings. Indicates specific areas of focus to maximise gains. Provides fully validated documentation in support of either CAPEX proposals, Business case or PID Project initiation document(s). Can be split out in any order – National, Regional, District, Zone, Area, Town etc. The PRO-UTILISE product is operated individually and specifically with each client. TRIWAY Solutions Limited provide end to end delivery of the PRO-UTILISE solution including Design, Development, Customisation, Delivery and any subsequent client required consultation including additional scenario routines.